Yet records discovered by “Frontline,” McClatchy and ProPublica reveal publicly for the first time that Ivins made available at least three other samples that the investigation ultimately found to contain the crucial variants, including one after he allegedly tried to deceive investigators with the April submission. Rachel Lieber, the lead prosecutor in a case that will never go to trial, thinks that Ivins manipulated his sample to cover his tracks. “If you send something that is supposed to be from the murder weapon, but you send something that doesn’t match, that’s the ultimate act of deception. That’s why it’s so important,” Lieber said. But did Ivins really manipulate the sample? That is not entirely clear, especially when the microbiology and genetics relevant to the situation are considered along with the new knowledge that three other samples submitted by Ivins did have all of the genetic variants present. The photo above comes from the National Academy of Science report on their investigation into the scientific approach taken by the FBI in the Amerithrax investigation. 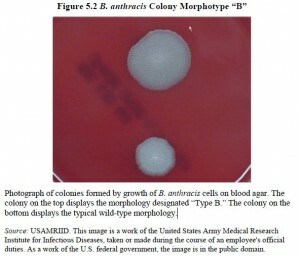 The photo shows the subtle difference in the growth habit on agar for a colony arising from a single normal cell (bottom) and a colony arising from a single variant cell (top). For their analysis, the FBI developed DNA tests that could distinguish four specific mutations that could produce four of the colony variants observed. It should be noted that the FBI found that in some cases, more than one different DNA change within the same gene could produce the same apparent colony shape variant, but they chose a single DNA change to track for each colony variant. Finding 5.5: Specific molecular assays were developed for some of the B. anthracis Ames genotypes (those designated A1, A3, D, and E) found in the letters. These assays provided a useful approach for assessing possible relationships among the populations of B. anthracis spores in the letters and in samples that were subsequently collected for the FBI Repository (see also Chapter 6). However, more could have been done to determine the performance characteristics of these assays. In addition, the assays did not measure the relative abundance of the variant morphotype mutations, which might have been valuable and could be important in future investigations. Keep in mind that RMR-1029 contained material produced in multiple fermenter runs at Dugway and a number of flask cultures at USAMRIID. Each individual culture that went into the RMR-1029 had the potential to produce its own spectrum of randomly arising DNA mutations which could have manifested as one of the colony variants chosen for analysis. Note also that the attack material was produced in one or more cultures presumably initiated with material arising from RMR-1029. The way in which the “starter” material was removed from RMR-1029 and how it was used to start the attack culture(s) would determine which variants were carried along, and in what ratios to one another and to the “normal” type. Furthermore, the conditions under which the attack cultures were produced would affect the final spectrum of variants present in the attack spore preparation. A bacterial streak plate used to isolate colonies from single cells. 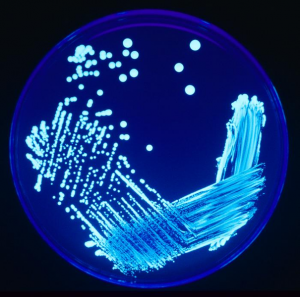 To produce such a plate, the microbiologist starts with a liquid suspension of the old culture and dips into it a small sterilized wire loop which brings along with it a very small sample of the culture. The loop is then rubbed lightly over a small portion of the surface of a nutrient agar plate. The loop is then lifted off the surface of the agar, the plate rotated a few degrees, and the loop is rubbed lightly over the agar surface again, overlapping with the original area that received the liquid from the starter culture. This process is repeated several more times. After the plate is incubated for an appropriate amount of time, the pattern seen in the photo emerges. Because the concentration of bacteria in the starter culture is high, the region of the plate receiving the liquid directly from the starter culture is completely covered with a “lawn” of bacteria. As the starter bacteria are diluted with the successive rotations of the plate, individual colonies become apparent. 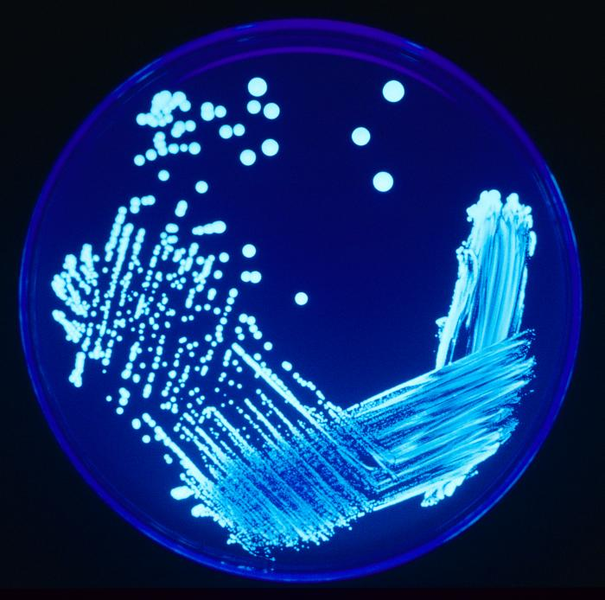 The larger colonies separated by relatively large distances from one another can safely be assumed to have started from individual cells being deposited on the agar by the loop. 1. Collect each B. anthracis Ames strain stock as per your institutional inventory and personal knowledge. 2. Prepare a minimum of two TSA [tryptic soy agar] slant tubes per stock by prelabeling with permanent waterproof labels. Include the following information on the label: “B. anthracis Ames strain,” with other designators used by your laboratory, date and your lab name. Additional information for each stock shall be provided separately. 3. A representative sample of each stock shall be used for inoculation of the TSA slants. If the stock is an agar culture, do not use a single colony, but rather use an inoculum taken across multiple colonies. Thawed frozen stocks or other liquid suspensions shall be well mixed prior to transfer of inoculum to the TSA. 4. Inoculate each TSA slant in a zig zag manner over the surface of the agar. 5. Incubate the slants at 35ºC – 37ºC for 12-18 hr to confirm culture growth. 6. Individually wrap the slants in packaging materials approved for shipment of infectious select agents in accordance with regulations for the shipment of such materials. On or before March 28, 2002 – the date the FBIR was officially up and running and had received its first sample, FBIR001 -Dr. Ezzell’s lab technician advised Dr. Ivins and his lab technician that their submissions were not prepared according to the protocol. Specifically, Dr. Ivins and his lab technician used homemade slants as opposed to the commercially available Remel slants specified by the protocol, so the four slants prepared on February 27, 2002 were rejected by the FBIR, and Dr. Ivins was told to resubmit his culture samples on the appropriate slants. Note that the portion of the protocol that the FBI put into the Amerithrax report did not mention that the TSA slant tubes had to be commercially prepared rather than homemade. Tryptic soy agar is one of the most widely used culture media in microbiology and it is not at all uncommon for researchers to prepare their own slants, as many laboratories go through very large volumes of both petri dishes and slants with TSA. In April 2002, Ivins prepared a third sample from RMR-1029. This time, his lawyer said, he plucked a sample using a technique called a “single colony pick,” a method biologists use to maintain purity when growing bacteria. Ultimately, this sample tested negative for the morphs. Prosecutors said they’re not even sure that the sample Ivins submitted came from the flask. If it did, they said, he obstructed justice, since their subpoena instructed scientists to capture diverse samples of spores that would be sure to reproduce any morphs. Ivins told investigators he’d followed standard procedures for microbiologists when he sampled just one colony. On February 27, 2002, one of the FBI Special Agents heading up the scientific side of the investigation received a telephone call from Dr. Ivins regarding the submission. This agent no longer has an independent recollection of the telephone call from Ivins, but his contemporaneous notes from the call reflected that Dr. Ivins identified himself as a research microbiologist and provided his telephone number and facsimile number. Dr. Ivins also identified which cultures of B. anthracis he had in his possession, though RMR-1029 was not listed. One of the cultures noted, however, was “1987 spores fm Dugway,” which is likely a reference to RMR-1029 with an incorrect date of 1987 instead of 1997. The agent noted: “will set up slants per subpoena today,” referencing Dr. Ivins. Given the notation of Dr. Ivins’s fax number and this statement, this agent believes that he faxed the protocol to Dr. Ivins that day for use in preparing his submissions. Again, it seems important to me that the version of the protocol the FBI chose to insert into this section of the Amerithrax report does not have the instruction to use a commercial TSA slant. Is there another version of the protocol? Was that other version in the subpoena itself? [I will attempt to track down the actual subpoena, but the FBI document dump is not indexed.] Depending on how carefully Ivins reviewed the protocol instructions in April for his resubmission, and possibly which version of the protocol he may have reviewed, it is not all that surprising Ivins would rely on a single colony isolate for the RMR-1029 sample he submitted. Admittedly, the instructions in the Amerithrax report specifically state “liquid suspensions shall be well mixed prior to transfer of inoculum” and RMR-1029 was a highly concentrated liquid suspension. However, the same section also states “If the stock is an agar culture, do not use a single colony, but rather use an inoculum taken across multiple colonies.” This part is really sloppy, as “multiple colonies” normally would be interpreted to be as few as three or four and most likely not more than ten. Sampling in this way would be very likely to miss most if not all of the morphological variants present at low concentration, so sampling “multiple colonies” in this way would almost certainly give the same result as picking a single colony, is Ivins is believed to have done. The ProPublica article points out that just before he submitted the homemade slant, Ivins had been discussing with the FBI the possibility of using DNA analysis to type the morphological variants and to use that information as a tool in identifying the source of the material used in the attacks. Note that this first sample he submitted after the discussion had all the variants present, but was rejected by the FBI. Although we will never know why Ivins used a single colony for the April submission, it could be as simple as him being busy and not looking back carefully at the instructions. It also is very likely that Ivins (and the other researchers submitting samples) was not told the exact nature of the analyses to be carried out. The DNA typing that eventually was carried out along the lines that Ivins had suggested above had not yet been developed in 2002 when he submitted this sample. If he suspected that DNA analysis was to be carried out, using a single colony would have been the logical choice, since a mixed population could produce ambiguous results in DNA sequencing. However, the fact remains that three out of four samples the FBI got from Ivins had the morphological variants present, so their continued insistence that the one sample lacking them is evidence of his guilt is hard to fathom. so their continued insistence that the one sample lacking them is evidence of his guilt is hard to fathom. No it isn’t. They’re behaving like a teenager caught in a lie. @BoxTurtle: Well, rednecks are known to behave that way too, come to think of it. OT: Marcy, you might find this interesting if you aren’t already on it. Apologies for off-topic, but the Guardian is just publishing a scam by WSJ regarding what are basically very bogus circulation figures. Without the payment, the Journal could not officially record the sales and their circulation figures would suddenly dive by 16%, undermining the confidence of advertisers and readers. Sorry for the off-topic, but this feels seismic. I have not been following this story closely enough. How many anthrax researchers are out there when one ignores workers in labs at Battelle, Dugway, and DRES? Since “FBIR” lab received Ivins’ and the rest of USAMRIID agar slants, then obviously the FBIR lab was set up for handling the material. Why then didn’t the FBI just have the FBIR lab personnel do all the prep work instead of relying on possible “suspects” to prepare them? In other words, had someone else, other than Ivins, prepared and submitted the agar slants to the FBIR, then there would be no reason to say Ivins was trying to impede the Amerithrax investigation. Or would this have also worked against Ivins? Cultures from his flasks would match the genetic variants found in the anthrax letters and he would have been labelled the culprit. So it helps us (if not Ivins, since he is dead) that Ivins made the preparations and 3 of the 4 samples he submitted matched the Amerithrax variants, showing as Jim White says above, that Ivins did not appear to be impeding the investigation. Thank you, Jim, for staying “on” this appalling story; the blatant attempt by the US government to frame Bruce Ivins, to cover up the truth, and to protect those who are actually guilty. Your efforts, most of which I have read, from the very beginning of your posts on this topic, back on FDL, to bring clarity and truth to the anthrax madness, deserve very high praise and serious recognition. And, if the public ever comes to learn the truth, then I hope that such praise and honest recognition are speedily forthcoming. Let’s not forget that we had the initial fingerpointing at Iraq [Saddam was the public enemy du jour then] based on the chemical signature that turned out to be falsely reported by the FBI [which supports item #2 above, I would think]. Then we had Contestant #1, Steve Hatfill, who fought back and sued the USG for his pains and won, and we have the completely unraveled case for Bruce Ivins, whose family ought to be suing as well. So why go to these lengths if the classic “lantern-jawed straight arrowed Elliot Ness types” are already non-operational as a theme? All of the floundering will make it impossible to convict the real perps because all of these errors are reported and a gift to the defense for reasonable doubt. Someday the PTB will realize that the truth will set them free. I’m afraid it will be after Darth’s heart pump fails, because he is one of the very few operating in the shadows as he did with the motive and access to do the deed. Remember, as a colony of anthrax multiplies it creates a spectrum of genetic variants naturally. So contamination did not necessarily happen. @pdaly: You are reading that correctly. Here’s a post where I went into the known details of the production of RMR-1029. Thank you for this information and analysis. I have followed this story on this blog with interest since the psychological aspects of the case struck me as odd, and have been troubled by the incident of the incorrect sample collection, among other things. This posting helps cast light on it. Last night I saw the Frontline treatment of the story and was struck by two things. First, another researcher from the USAMRID lab stated that he had also submitted samples of cultures, all of which reported negative for a match to the RMR-1029 flask. Yet he was not accused of trying to mislead the FBI. Second, after presenting the non-corraborative findings by the National Academy of Sciences, the FBI prosecutor was shown glibly leading us thru a “reasoning” process that claimed that: disregarding the scientific data(!?!) all the other facts point to Ivins. She stated that he had submitted incorrect samples to mislead the investigation, to hide his guilt. The observed fact was that Ivins’ sample had been rejected. All that talk about why, (to mislead, to hide guilt) is pure speculation, and speculation that seems to lead to a predetermined conclusion. Again, what has been observed is that something in the data collection process did not produce the expected results, and as any good investigator should do, the process should have been examined. Further, it would seem that there is room in this saga for the role of plain old egos in conflict, in which the FBI is telling researchers (who are more capable of doing the required analysis than the FBI lab) how to collect samples, and the experts thinking they know how best to handle the materials and conduct forensic analysis. Who would believe that bureaucrats could engage in turf battles to the detriment of the public good? @rg: One thing that needs to be pointed out is that the bulk of the DNA analyses were carried out by academic and private laboratories under contract from (and somewhat under the supervision of) the FBI, rather than all of this work taking place in FBI labs. That’s a long way of stating that the initial rejection of the Ivins sample likely can be attributed to simple a bureaucratic SNAFU. Note that the passage I quoted about the rejection showed that the contracting lab was just getting set up and starting to take samples when it pronounced that the wrong sort of slant tube had been submitted. @Jim White: I take your point. However, your interesting post provides detail that renders the term SNAFU inapt. Sure, there is room for problems to develop in protocol establishment, and these problems are expected in any experimental environment. Yet the data are being used to pronounce guilt of a crime (a criminal justice environment), and the fact of errors is/was being interpreted as proof of such. This is not a criticism of your remarks as much as a critique of the FBI’s case against Ivins. @rg: Your point about that other researcher–Heine–is all the more telling given that he was a suspect at one point, IIRC. @rg: Oh, I agree entirely. Once the FBI went ahead with the analysis of the rejected sample and found the variants present, the results obtained should have become just as important in the case as the results from the sample that showed no variants. The first bit was SNAFU, the followup was dangerously close to illegal suppression of potentially exculpatory information. So why was Heine off the hook and Ivins on [after they tried Hatfill]? I know the FBI keeps trying to say all of the other facts fit, but like Palin’s “cleared in all my investigations” pronouncements, that simply isn’t true. Almost none of the facts fit Ivins, RMR-1029 was the only one, and I’d call it dubious at best as the announced FBI theories have evolved over time. And as noted above, it seems possible that a sample labeled “RMR-1029” in the official records wasn’t from that flask. Jim should get a Pulitzer for this reporting. pdaly is correct that genetic variations happen in culture, look at how hard it is to deal with the flu every year. If I remember this correctly, it was the presence of tin that flagged this strain. Tin cannot be formed by biological action, it’s an element which would have to be incorporated from another source. That being said, bugs swap stuff all of the time all the way to the genetic level. @rugger9: The tin story is very interesting. Tin could not have been biologically incorporated into the spores as they were cultured: it is toxic. The FBI initially was very interested in the tin content of the spore powder recovered from the attack material but then suddenly dropped it as a point of interest as they built the “case” against Ivins. The recent discovery by the McClatchy/ProPublica/Frontline crew, aided by the scientists who recently published a paper on the topic, showed that the combination of high silicon and high tin in the attack material suggests a very high-tech technique for “weaponizing” the spores to make them more dangerous. This weaponization step would have taken place after the spores were cultured and purified and would have taken both equipment and expertise that it is clear Ivins did not have. @emptywheel: Your recall tends to be legendary, while mine is embarrassing, yet the Frontline story didn’t mention that. It would be interesting to know why he was a temporary suspect, and what changed. I just noticed that I stated @ 10 above that Heine’s sample did not match RMR-1029, but IIRC the envelope sample had been traced to USAMRID and individual reasearcher samples were being compared to the letter sample. A positive/negative rating referred to a yes/no match. If the letters originated from USAMRID, all the materials in that lab should have matched. If not, one should have asked raised a number of questions, but the first would have to do with the protocol process, and next would be the reasoning from which the the match was deemed necessary. It would be a long way before concluding that someone in the lab was a suspect. @rg: I’ll need to go back and check my work. But I think he, plus one other person who was also defending Ivins, also came under scrutiny. I think I get taht from the larger FBI materials. One thing to note is that they redacted certain names–I took that as confirmation they were or might have been suspects–and not others in the same lab. In other words, they legitimately tried to protect these people, because the reason they were investigated had to do with teh sameples and the access to the labs. We know from Ivins’ notebook Heine got samples. Blowing the FBI narrative to bits, even more than before. At what point will the FBI stop beating the dead horse that’s already hamburger? I’d like to take a moment to advocate a return to an earlier characteristic of the REPLY function. Time was that it flagged not only the name of the commenter but the comment number as well. This info is helpful when there are multiple comments by the same person, for example a reply to Jim White today could refer to one of several remarks. Thanks for listening. @Jim White: Jim, i understand that the presence of tin and weaponization tends to exonerate Ivins, because it indicates a more-sophisticated operation. You posited some kind of rogue, under-the-radar, low-budget lab somewhere. but would such a lab have the capability to weaponize the anthrax? Also, I understand that the first batch of anthrax mailed out was much poorer-quality than the second. How are we to account for this? Did the bad guy get better at making bugs over a few days – OR – did the perpetrator find disappointing results from the first batch (which might have been prepared to mimic a “garage” operation) and try again with a more hepped-up batch? @al75: The weaponization involves chemistry that Ivins would not have known how to do and did not have the equipment to do safely. For someone in the low-budget lab, the equipment for this, provided they had the expertise, would affect the budget only moderately (if my rough understanding of the chemistry isn’t too far off). As for the two batches differing, I’ve always been unable to determine whether there was one large, weaponized batch that was “cut” with other materials to provide more material to work with (there was even a second, none pathogenic bacterium in this messier material) and used in the earlier mailing to targets of lower importance, followed by the high grade pure stuff being sent to the high level Senate targets or if your scenario of improving quality in two successive batches is a better explanation of what happened. We just don’t have enough information to make that call. Here’s a quote from the live chat that highlights the ramifications of the Ivins RMR-1029 flask being a downstream product of the Dugway cultures and the ramifications, as well, for the Ivins RMR-1029 flask being the frequent subsequent source for researchers prior to 9/11 and the anthrax attacks. The FBI has not offered us definitive proof that the anthrax in the attack letters necessarily came from RMR-1029 to the exclusion of these other sources. Mike Wiser: According to the FBI and Department of Justice, investigators ruled out the hundreds of other scientists who had access to RMR-1029–Ivins flask that contained the key genetic markers that seemed to match the attack anthrax. It’s unclear how complete their investigation was, because the records of their investigation of the hundreds of other suspects have not been released. As far as other upstream sources, much of the Ames strain in RMR-1029 was grown at Dugway in Utah. The NAS says that is the most likely place where the genetic mutations originated. The FBI apparently concluded that Dugway was not a possible source of the anthrax in the letters, but again it is impossible to evaluate how they reached that conclusion based on the public record and files released so far. There was also the ‘person of interest’ Dr. Philip Zack, who reportedly had access to the Ames strain and had showed “hostile behavior” towards colleague Dr. Ayaad Assaad. Sounds like the FBI had a field day pitting coworkers against one another. @pdaly: They also stated in the chat that the way Dugway scientists were excluded as suspects was to determine that none of them had the time to fly to Princeton and back in the timeframe the letters were mailed. I find this really weak, because a Dugway source of the attack could be either an organized plot with a number of government actors or a “lone wolf” situation and the FBI only looked for lone wolf situations. It did not allow for a situation where Dugway personnel produced the spores and provided them to a courier who then took them to the attack zone. Any conspiracy blows up the last best hope for the FBI on nailing anyone for this: Ivins as a lone wolf. Any hint of one does in the LW theory as well, and there is no reason I can see that the FBI could pin a LW theory on Hatfill or Ivins if there was a conspiracy. People would ask about the others. That said, your theory makes sense, expands the timeline for delivery, and may even explain why Miller was sent phonies [my rank speculation is that this detail directly points towards Cheney and his henchmen, they knew they needed her later] while everyone else got the real thing. I’ll suggest that one issue to consider would be what mechanism made Ivins so ill.